Title text: I'm the proud parent of an honor student, and the person driving me is proud, too! This comic was released eleven days before the United States midterm elections on Tuesday, November 6, 2018 and even the header text at the top of the xkcd page had changed a few days before by showing a link to vote.org to help US citizens to register and finding their polling places. Randall uses a neutral way to encourage people to use the right to rule their governmental representatives. Only before the presidential election, 2016 he took sides to one party as done in the comic 1756: I'm With Her (see more here). The bumper sticker on the car in the comic is a variation of a sticker used to both encourage people to vote, as well as express their political position: "I'm a ___, and I vote" (where the blank is traditionally filled in with "Union Worker", "Catholic", "Senior Citizen", "Gun Owner" or some other demographic or organizational membership). However here it is attributed to an automobile which is not capable of voting. The title text seems to be another typical message on a bumper sticker, saying that the driver is a "Proud Parent Of An Honor Student". However, this sticker is a bit longer, since it continues to state that "the person driving me is proud, too". Thus once again it is the car who is the proud parent. And thus maybe it is a car that is the honor student? Another thought is that this may be a reference to the 1965-66 TV sitcom My Mother The Car. This is the third comic displaying a bumper sticker, after the comics 80: My Other Car and 1033: Formal Logic that came out in 2006 and 2012 respectively. Bumper stickers also are mentioned as a future milestone for self-driving cars in 1925: Self-Driving Car Milestones. Randall also sells bumper stickers with the word "OPINIONS!" on them at the xkcd-store. Someone added text suggesting this comic was inspired by the stickers on the bomber's vehicle. Then someone else deleted that text because the comic had been posted before the bomber was arrested so Randall could not have known about the bomber's vehicle. Does that mean it was a coincidence? 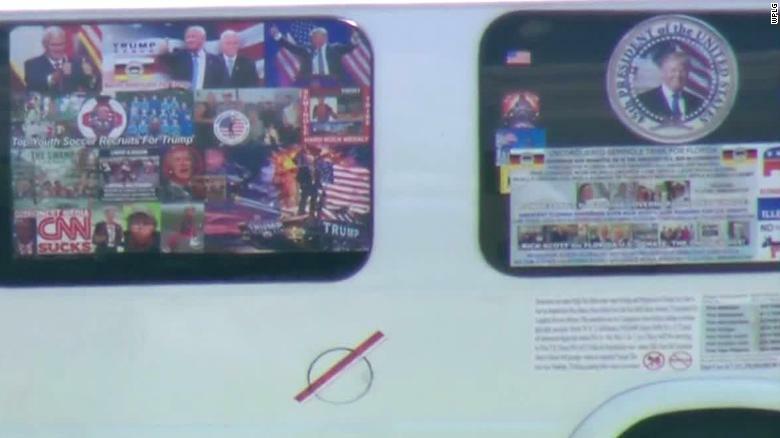 Or could the bomber have seen the comic and been inspired by it to put the stickers on the vehicle? This page was last edited on 29 March 2019, at 16:31.